Alun-alun is Indonesian for an open space or field. A kraton, or palace (the kraton grounds is actually a city with the palace within the confines of a perimeter wall) must have two alun-alun, a north court (called Alun-alun Lor) and a usually smaller, southern alun-alun, called Alun-alun Kidul, with kidul meaning south. The Alun-alun Kidul in Yogyakarta is a place where locals go to on weekends to let a bit of their hair down and have some healthy, family fun. 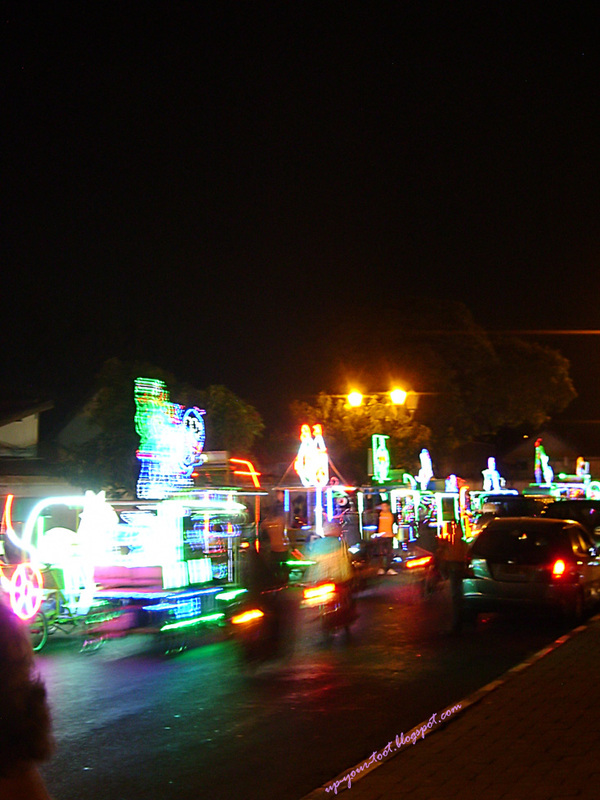 The colourful, LED-lit rides that is part of the attractions at Alun-alun Kidul, Yogyakarta. Whoa, make way for the Angry Birds pimp-mobile. 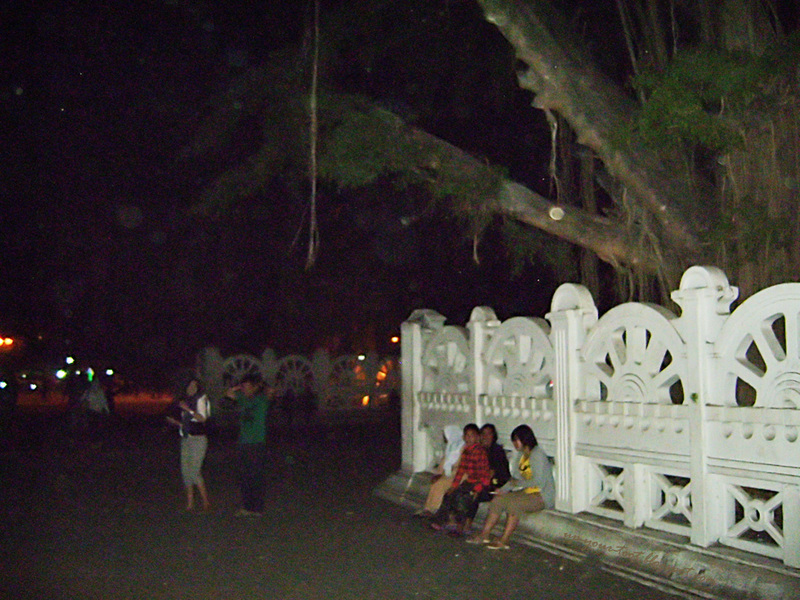 Also, the Alun-alun Kidul is home to a pair of Banyan trees (pokok beringin – most likely Ficus benjamina) that local folklore has it that whosoever can navigate between the pair of trees without any mishap whilst blindfolded, then he or she has a pure heart and whatever they wished for will come true. This ceremony is called Masangin, which means to walk between the two banyan trees in the middle of the square (masuk di antara dua beringin). Nowadays, many local youths come to the Alun-alun Kidul on Friday or Saturday nights and give this activity a try, usually girlfriend egging the boyfriend to try or vice-versa, perhaps as a test of their partners’ purity (most of them end up disappointed though). To carry out this activity, one is advised to stand approximately 15-25 metres from the trees on the northern side (at the Gedung Sasana Hinggil side facing south – i.e. facing the Jalan Gading city gates), and be blindfolded. Some suggest that the person be turned 360 degrees and then made to face due south, straight in line between the two banyan trees. The blindfolded person now must walk towards the gap between the two trees, without any assistance or interference from his/her friends. It is good to have friends around to silently move the crowd away from the path of the blindfolded person, as the grounds do get pretty busy. Blindfolds can be rented at IDR 3000, which is approximately RM1 at the time of visit. The base of the two Banyan trees are surrounded by an ornate perimeter. I am standing at the endpoint of my attempt to cross between the two trees. Obviously I am a little quite way off to the right of the gap between the two trees. When I tried it, I veered to the right, just passing the perimeter of the right banyan tree. Guess my wish won’t come through then. So after you’ve tried doing Masangin, another fun thing to do is to watch people doing it and laugh at them. Some will immediately start to veer so much to the left or right that they end up going in circles and back to where they started from. During my time there, I did not see any single person who managed to get between the gap of the twin Beringin trees. I think it is almost an impossible task to be able to walk straight whilst being blindfolded, as it has been shown in one of the episodes of Mythbusters that without visual clues; most people will tend to veer to one dominant direction. Besides the Masangin, there are also brightly pimped out rides that you can rent at the Alun-alun Kidal. These LED-lighted, bicycle-converted family or couple-ride thingies have illuminated cartoon characters such as Angry Birds, Donald Duck, Hello Kitty and even Doraemon, as well as cute froggies and I Heart Yogya ones. 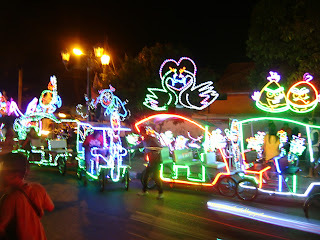 As people ride along the square, the lights from these vehicles gives the square a carnival-like atmosphere. If you do get in one of these rides, make sure you do not ride these vehicles outside the square; they are only meant to be used within the alun-alun. A multitude of LED-lighted vehicles transforms the road into a river of lights. 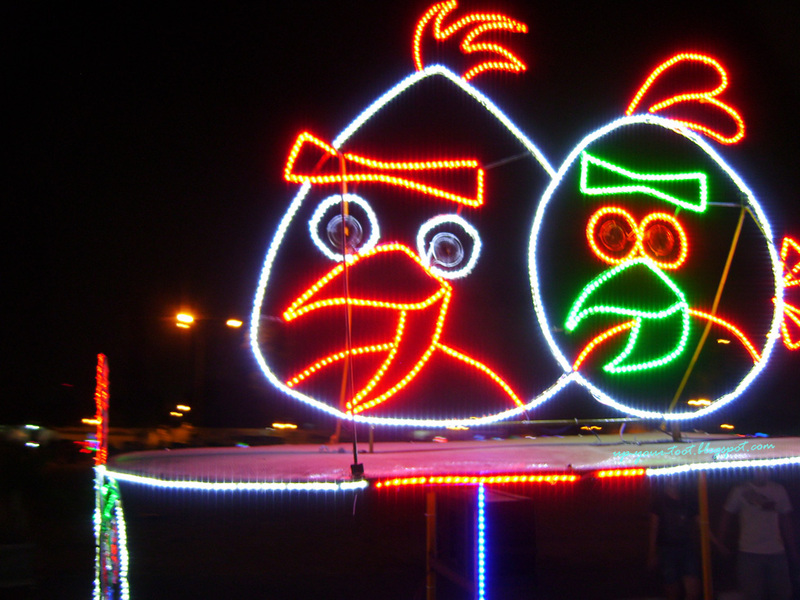 Angry Birds ride, anyone? The best rides to go crash on some bad piggies. If you do get hungry and worn out after all the walking and cycling, do not fret, for there are plenty of peddlers selling food and drinks all along the square. You can sit on the ground and use a low table to enjoy the local food sold by these peddlers. An, An An tottemo da-isuki Dora-e-mon. Notice the lady that is about to cross the street - she is a peddler heading back home as she has had a sold-out night. Most of the visitors to this square are locals or domestic tourist. It is their form of a weekend entertainment. However, I feel that this place has a sort of charm that should be made known to more people. 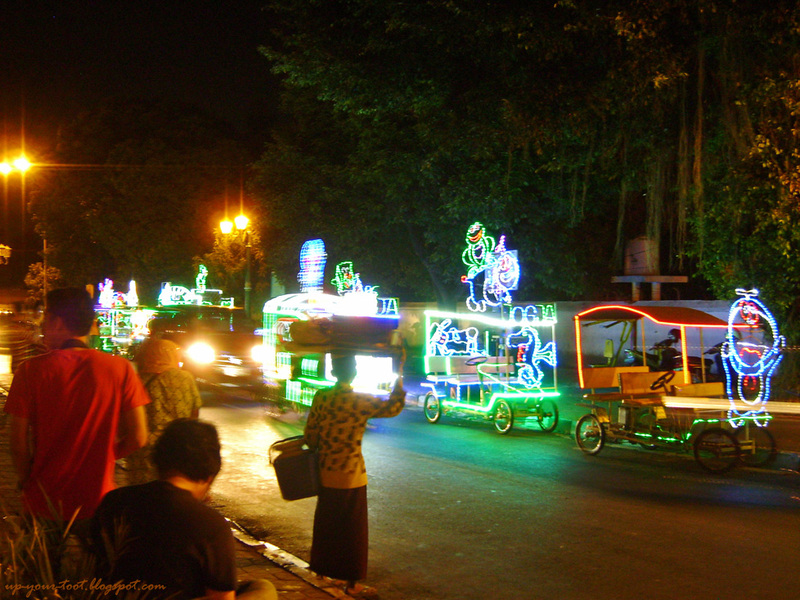 Tell any taxi driver or bechak (trishaw) driver that you want to go to Alun-alun Kidul and they will get you there. If you are staying at the Jalan Prawirotaman 1 area, you can even walk there. Just head westwards on Jalan Prawirotaman 1 towards the intersection of Jalan Parang Tritis-Tirtodipuran-Prawirotaman1 (the Wisma Gajah guesthouse end) and turn right into Jalan Parang Tritis. Walk until you reach the end of the road and come to a major intersection where you can see the walls of the kraton (a white wall with a bastion at the corner) on the opposite side. Turn left into Jalan Mayor Jeneral Sutoyo. 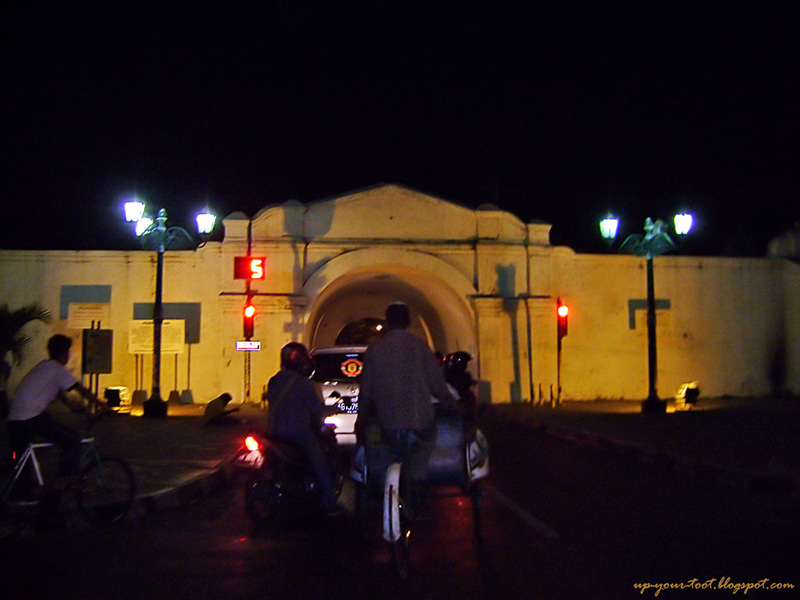 You will have the kraton wall on your right, parallel to the road. Walk down this road until you reach a crossroad and an opening appears in the kraton wall on your right. Turn right to cross the road and go through this city wall entrance – this is Jalan Gading. When you the end of Jalan Gading, you will see the open field and the pair of banyan trees of Alun-alun Kidul. For the sake of trying a bechak, J whom had graciously hosted us, paid for our trip back to his place in a bechak. Going back home on a bechak (trishaw). That is the southern kraton entrance (or rather the exit, as I am leaving the kraton grounds).